Semi-permanent installation a sure sign that Louisville will "knot" accept the Ninth Street Divide. Short of demolishing the tangled steel and concrete megalith hovering over Main Street between Ninth and Tenth streets, we’re stuck with the so-called Ninth Street Divide. That rift in the urban fabric is too tangible, too visual—too visceral—to be overcome without a major physical change. But with no funding in hand (the city failed to secure federal TIGER funding for the project) and a new federal government not keen on the transformative TIGER program, it’s sensible to look for temporary interventions that can diminish the divide—or at least create a dramatic space for parties. 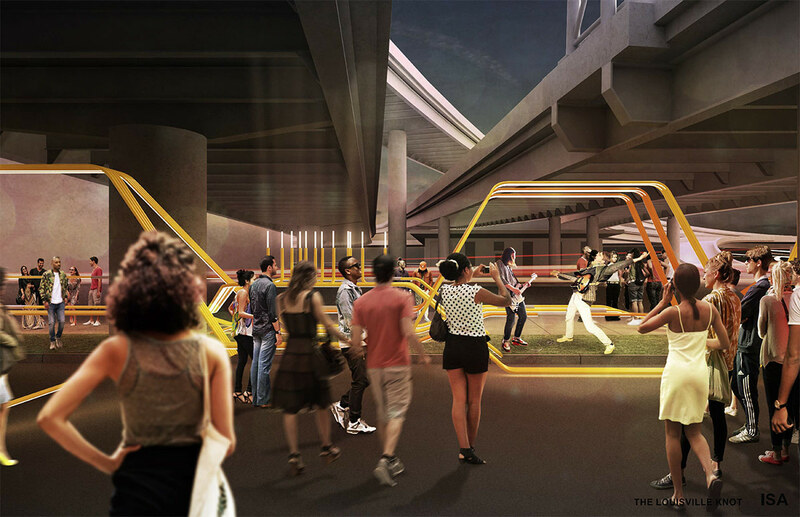 That’s essentially what’s behind a public art project sponsored by Metro Louisville, the Louisville Downtown Partnership, and others, to build a temporary installation beneath the overpass spans. Last September, a winning design team including Philadelphia-based Interface Studio Architects (ISA) with Cambridge, MA–based Lam Partners and locals Shine Contracting, Core Design, and Element Design was announced. The team won a national design competition to build the $150,000 project. While the unveiling was delayed several months, it appears to be well worth the wait. Phillips said there were a lot of regulatory hoops to jump through involving various city and state agencies that were all required to sign off on the proposal. For instance, the Kentucky Transportation Cabinet preferred that the installation, including lighting, not touch the highway structure itself. Others were concerned with maintenance and safety. Phillips said working with such constraints forced the team to be more creative. 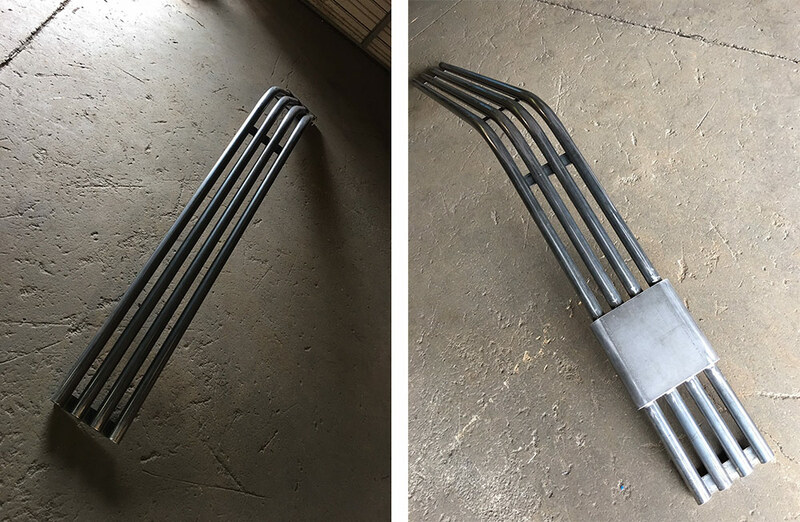 The Louisville Knot, according to the design team, is a linear piece of street furniture stretching from one side of the Divide to the other. It’s a tangle of custom-fabricated metal pieces that resemble, well, a knot. Each colorful strand of four tubes rises up and down to shape views, create portals, and provide seating. Core Design’s handiwork will house lighting and provide a flexible armature than can accommodate a variety of uses. The Louisville Knot occupies a rather slender site on the 900 block of West Main Street. Because of the dangerous lack of a pedestrian crossing at the Interstate 64 onramp, the project was limited to the south side where it would utilize the small Happy Birthday Parking Lot also covered by the ramps. The lot can accommodate large crowds or a couple food trucks depending on what kind of event is going on. The street layout at the Divide “is a weird situation that I don’t think can be fixed by lighting or installation,” Phillips said. “It’s a traffic geometry problem.” He hopes that revitalizing the space could serve as the catalyst needed to get public support for more substantial changes. In the spectrum of urban interventions, the Louisville Knot is more than tactical urbanism but less than a concrete long-term solution. Phillips described the project as semi-permanent, or lasting at least several years. The goal is that the installation serves as a beacon that attracts people, like moths to a flame, to the dispirited tract. “One of the ideas is that there’s an interaction between the permanent and the temporary,” Phillips said. “That means there could be the invitation for others to bring temporary energy to the installation.” The space will be heavily programmed to draw people in to experience the Knot. One major challenge for the installation is to not just get people underneath the highway, but to spur them westward to explore a familiar yet mysterious urban terrain—and ideally patronize some of the businesses setting up shop west of Ninth Street. While disinvestment combined with poor preservation policies have created a cratered cityscape, there’s still a lot to see and do. Businesses like Over the Nine, Falls City Beer, the Old 502 Winery, Peerless Distillery, Caufield’s Novelty (with Louisville’s other giant bat), and the Flux Gallery are all within blocks of the Louisville Knot. But will people accustomed to the eastern side of the Divide venture farther west? With virtually no one living in the West Main Street corridor today, it’s safe to assume that visitors from the eastern half will predominate from the near and far suburbs. And perhaps simply getting people to the 900 block for a programmed event will be a victory. Activity and better lighting will certainly be a boon for safety of those who pass through daily. Whether the Knot is a destination in and of itself or a stimulus for blocks west will be among the most important observations of the project. The city hopes to open the Louisville Knot this summer at which point you can expect plenty of planned activities to launch. What do you think of the Knot? Will it help mend the Ninth Street Divide? Will you be hanging out there after work or on the weekends? Share your thoughts in the comments below, and we’ll see you at the Knot! build new soccer stadium on the 9th street side of downtown… perfect black is the empty one between 8th and 9th and market and liberty.. ultra modern steel and glass coming down into downtown from the 9th street ramp…….. Interesting timing. I’m proposing something similar to Bernard Tschumi’s Park de la Vilette’s “Follies”(red lacquered archetypes) along the Barrett Avenue side of the Urban County Government site, since that avenue contains a bit of compression release compared to what I’m drawing up for the rest of the site. (I’m no developer, no RFP, just riffing out loud, along with my International City Market at Louisville Gardens concept). Bill’s comment above is interesting as I’ve also dumped my dream soccer stadium along 9th Street. Dovetails perfectly with the international theme of the Gardens. I don’t know who did that cardinal mural at that underpass, but it’s a beauty. I wonder how much money they spent in consulting fees to come up with that idea? Frankly, it’s gonna take more than a simple metal pipe to enrich that intersection. Where is the artwork? Nothing looks different except the yellow pipes–murals? statues?